- Can be made in 2 colors or 1 single color as required. - For additional quantities please e-mail us. - Setup charges may apply. Natural leather cushion cover. 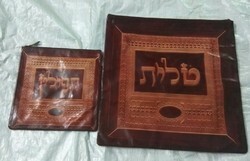 Can be customised in any leather, color, size or shape. The brown and black rough look cushion with mirror work and leather tassels. We have splendid collection of Leather Cushion Cover. 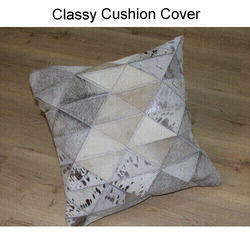 We are one of the leading Cushion Cover Manufacturer. We are renowned manufacturers and suppliers of premium quality Cushion Covers. These products are manufactured using high quality leather that is sourced from authentic vendors of the market. Our range is designed as per the latest market demand and the current prevailing changes. Further, we market them at affordable prices. We design Cushion Covers that are highly appealing. Our Cushion Covers recites the magnificent glory of excellent craftsmanship. Apart from the above, we provide Cushion Covers at the most discounted price in the Industry . - L - 12" X W - 12"